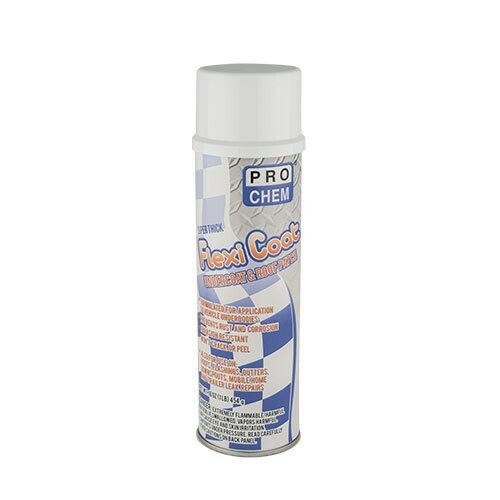 FLEXI COAT | Pro Chem, Inc.
FLEXI COAT is an undercoat and sound deadener that provides a durable, flexible, rubberized film that seals and acoustically reduces unwanted vibration and sound. It protects metal parts against the harmful effects of water, salt and road chemicals. 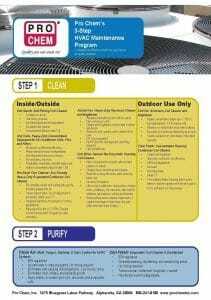 This product stays pliable in the cold of winter, yet will not sag, melt or drip in summer heat. It resists cracking, peeling and abrasion. This product can also be used as an effective roof patch and leak sealer. It can be used on all roofs, flashings, gutters, downspouts and also on sink drains. It leaves a flexible coating that will not freeze or crack, is abrasion-resistant and won’t peel. FLEXI COAT seals out rust and corrosion. Shake can vigorously until ball rattles freely for one minute. Shake occasionally during use. Hold cans 12 inches from surface. Spray a thin, even coat, building up desired thickness. Remove overspray with a cloth dampened with kerosene. Note: To prevent clogging of tip, turn can upside down and depress tip for 2 seconds. Wipe tip clean. *Do not apply to hot equipment. Does contain flammable solvents and will run if applied to surfaces with temperatures above 300°F.